Somewhere on my bookshelves, I used to have a copy of Salman Rushdie’s The Satanic Verses. Its pages slightly browning, because even though I never read it, it must be over 20 years ago that I bought it, and for some of those years it sat on a window sill in the sun. But had it survived the downsizing, and terrible cull of books, that took place when we moved to Thame? This search happened after I was reminded of Rushdie’s book by the recent BBC2 documentary, The Satanic Verses 30 Years On. In this film, presenter Mobeen Azhar examines the lasting effect Salman Rushdie’s The Satanic Verses has had on the Muslim community and how the events of 1989 continue to have an impact today. Those ‘events’ followed the book’s first publication, when Muslims in Britain were scandalized by Rushdie’s fiction, convinced that it was a blasphemous affront to Islam. Huge demonstrations took place in Britain, where the book was notoriously burned in the public square in Bradford, and in other countries, especially Iran and the USA. Ayatollah Khomeini issued the notorious fatwah calling upon faithful Muslims to assassinate Rushdie, and death threats were also made against the book’s publishers and all the individuals who had been involved in its publication. 59 people lost their lives in the most violent demonstrations around the world. At the time there were laws against blasphemy in England and Wales, but they only protected the Christian religion. For a time there was some discussion, supported by a number of liberals and Christians, about extending the law to protect Islam and other faiths. In the end this did not happen: instead, the blasphemy law was repealed in its entirety in 2008, and may be considered to have been replaced (in part) by legislation against religious and racial hate crimes. Are human beings offended by material insulting to the God they believe in? They need to just get over it. Is God offended? I think God is likely to have a good laugh about the presumption of us thinking that God might be. But even if God is offended, I’m pretty sure God knows how to deal with it. Probably by grace, mercy, and love, and (I hope) opening the blasphemer’s eyes to see the foolishness of insulting the Divine. Somewhere high in the Austrian Alps there may lie the body of a librarian, for that is where Robert Proctor was last seen, at the head of the Taschach valley, on the morning of Sunday, 6 September 1903. The independent-minded quarterly that combines good looks, good writing and a personal approach. Slightly Foxed introduces its readers to books that are no longer new and fashionable but have lasting appeal. Good-humoured, unpretentious and a bit eccentric, it’s more like a well-read friend than a literary magazine. And for this particular retired vicar, in whose breast still beats the heart of a librarian, how could I not be intrigued to read of a colleague who met such a mysterious fate over a century ago? According to Wikipedia, one of Proctor’s friends thought the missing librarian may have committed suicide up there above the Taschach valley. But C. J. Wright leaves the mystery much more open. Perhaps in the far future, a few thousand years hence, his frozen and preserved body will be found, like that of Ötzi the Ice Man, and the mystery of his death be finally resolved. But perhaps it’s more fun that it’s not. Robert Peston for Prime Minister! His North London Jewish background is so familiar to me from my own history and native place. He’s my kind of political commentator, too, and in this book (bracketed by a letter to his much-loved late father) he addresses the problem of why the world has gone ‘bonkers’. How come the world’s most successful, wealthy democracies are throwing themselves into the arms of mad populist leaders, and voting for such lunacies as Brexit and Trump? Peston’s analysis and prescriptions sound totally like common sense; yet in the midst of all this madness which so often leaves me feeling really depressed, he somehow snatches hope, and a degree of optimism, from the jaws of despair. The key fact is that behind the madness of those 2016 votes, lies the deep dissatisfaction of all those in our societies who feel they have been left far behind in the growing prosperity they see around them. It’s this inequality of wealth, opportunity, prospects, and the fair sharing of the wealth of nations, that we need to address and radically change. It’s a call to the 48% to stop trying to stop Brexit (and if we can’t stop it, at least hoping it will be the unmitigated disaster we’ve all along said it would be), and to work as hard as we can to make it work the best it can. What’s needed is some kind of ‘Brexit mission’ to reunite the country, and mend what’s broken in our economy and politics. As Peston says, he doesn’t have all the answers, and maybe some of the answers he has are also bonkers. But we at least need to be thinking, and especially talking, about the issues he raises here. Hand on heart, I have a terrible confession to make. I have been one of those — and we are many, many — who have been secretly wondering if democracy is such a great idea after all. When we see Donald Trump in the White House, and the United Kingdom set on a collision course with the iceberg of a no-deal Brexit — all as a result of the democratic process — aren’t we bound to ask ourselves that question? They’d all be disenfranchised, and because it was their own fault, there would be concomitant small curtailments of their civil rights. You see how it begins? I’m already ten steps to becoming a Fascist dictator! So it’s great that Philip Collins has written When They Go Low, We Go High, published last year by 4th Estate, and surely not well enough known. It’s quickly rising up my list of Books That Everyone Must Read (especially if they want to be permitted to vote). (No!) Its subtitle is ‘Speeches that shape the world – and why we need them’. Philip Collins is a journalist, and was chief speechwriter for Tony Blair from 2004 to 2007. Though I’m trying hard not to hold that against him. But chiefly, he is passionate about democracy. This book is all about his conviction that liberal democracy is not only the best form of government, but the only one that really makes human flourishing possible. But he freely admits that democracy is in crisis, endangered on many fronts; though this is also nothing new. Perpetual crisis and danger seems, in fact, to be the permanent state of democracy. The book quotes and analyses many of the most important speeches that have been made all down the ages, from the time of Pericles to Barack Obama, about the importance of government ‘of the people, by the people, and for the people’. The list includes Cicero, Lincoln, Kennedy, Churchill, Reagan, Elizabeth I, Mandela, Aung San Suu Kyi, Martin Luther King among others. Alongside the extensive extracts are Collins’s comments about how each speech works, what makes it great and important, and why it matters. when politics prevails, the worst of human instincts can be tamed. Populism begins with recriminations about the governing elite and, to use Donald Trump’s extraordinary allegation, their ‘criminal enterprise’. It ends with recriminations about the constitution. All the while it claims to have special knowledge of the will of the people. It is a fraud from start to finish. Plato hated democracy because he thought it led to populist rulers. There is a risk, if we do not find the words to advertise the virtues of conventional politics, that Plato’s anguished prediction will be proved right. The task for the responsible democrat is therefore to describe what has gone awry and find words for a better future, like the wonderful writing in Jefferson’s 1801 Inaugural Address and the compressed poetic expression of Lincoln’s address at Gettysburg. The solution to disenchanted politics cannot be populism. It has to be better, more enchanted politics. I realise, reading this, that I had fallen from grace, become a backslider with regard to my faith in Democracy. I repent and recommit, and hope to make amends. But that means that, just as the subtitle of this blog pleads for a re-enchanted Church, so my citizenship pleads for just that re-enchanted politics. When he was 18 years old, Johann Hari went to his GP seeking help. He explained that he felt an enormous emotional pain that seemed to be leaking out of him uncontrollably. His doctor told him a story: that his distress was caused by a chemical imbalance in his brain, specifically a low level of something called serotonin. By taking antidepressants, his serotonin level could be restored and his depression would go away. Johann left the doctor, collected his prescription, and took the first of thousands of little tablets. Almost at once he felt relief, his pain seemed to be lifted. But after a couple of months, it returned and soon he felt just as bad as he had before. He returned to the GP, who prescribed a stronger dose. Again he felt an immediate improvement, which lasted for a few months until once more he fell into a severe depression. This process was repeated several times, until Johann was on the strongest dose of SSRIs, which he continued to take for 13 years. The side effects were horrifying. He put on huge amounts of weight as a consequence of almost compulsive junk food eating. And worst of all, he was still depressed. The drugs were not working for him, and he was not alone: although exact figures are not available for the UK, it is estimated that 1 in 5 US citizens are on antidepressants. It was at this stage that he began to ask why? Why are so many people depressed? Why are chemical treatments apparently so ineffective? What alternative remedies might there be? 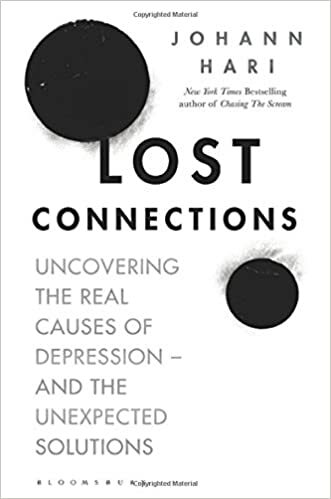 His latest book, Lost Connections: Uncovering the real causes of depression and the unexpected solutions, describes the results of his questions. He spent years looking at research data and interviewing the scientists who had collected it. He travelled all over the world, visiting many of the researchers but also going to places where different, innovative ways of dealing with depression had been tried. His concluded that depression is not in the head, but mostly caused by real factors in the world outside. The one thing most of those factors have in common is that modern society is sick, and it should come as no surprise that so many people respond to that sickness by falling ill themselves. Johann sums this up by describing it as a ‘loss of connection’, because of the way we are forced to live in the modern world. Among the nine causes of depression and anxiety that he has identified, he lists disconnection from meaningful work, from other people, from meaningful values, from childhood trauma, from status and respect, from the natural world, and from a hopeful and secure future. If you’re like me, you will respond to a lot of this by thinking, Of course, I’ve always known that; but why then don’t we, or doesn’t society, do something about it? Part of the answer is that Big Pharma makes billions of dollars from the widespread use of antidepressants (also they pay for and conduct most of the research which ‘proves’ the effectiveness of chemical antidepressants); but another large part is that there are too many other political vested interests that resist the major reforms to society that would help solve the problem. This is a brilliant book, informative, full of heart-warming stories that you just long to see turned into one of those ‘feel-good’ films about people battling against overwhelming odds, to turn around their own lives, and the life of their neighbourhood. There are lots of things we can do as individuals, to lift ourselves out of depression (or to improve our emotional health generally); but much more than that is needed. We need to be working for radical changes to society and the way we live. It doesn’t have to be like this. The changes we need are hard to imagine, difficult to begin, and yet many of them don’t require a lot of expense: they’re simple enough to do, they’re not rocket science. We know this stuff! Why don’t we do it, and why don’t we protest and keep protesting to the people in power to make these things happen? See and read much more about it on Johann Hari’s website.